Stems densely hairy. Leaf blades: basal sinus incisions relatively short or long, sometimes absent, abaxial surface usually irregularly or uniformly hairy, sometimes glabrous, nerves hairy throughout, adaxial usually densely hairy throughout, rarely only on folds. Inflorescences: primary branches densely hairy; peduncles hairy. Pedicels, or at least most, hairy. Flowers: hypanthium densely hairy. Greenland, N.B., Nfld. and Labr., N.S., Que., Europe. Subspecies vestita was recognized by M. L. Fernald (1950) and A. E. Roland and E. C. Smith (1966) as Alchemilla minor Hudson, a misapplication of that name. The subspecies is probably introduced in New Brunswick and Nova Scotia. 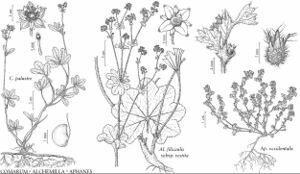 Facts about "Alchemilla filicaulis subsp. vestita"